Unfortunately we had no wins last week in the golf. We came extremely close with Rickie Fowler who was leading after the 2nd round. Unfortunately he had a very poor 3rd day and couldn’t come back from that. He came tied for 6th overall a whopping 6 strokes off the lead. If it wasn’t for that bad day he probably would have taken it down oh well. It was still a solid tournament and hte first couple of days were exciting. This week we have the WGC Cadillac Championship. 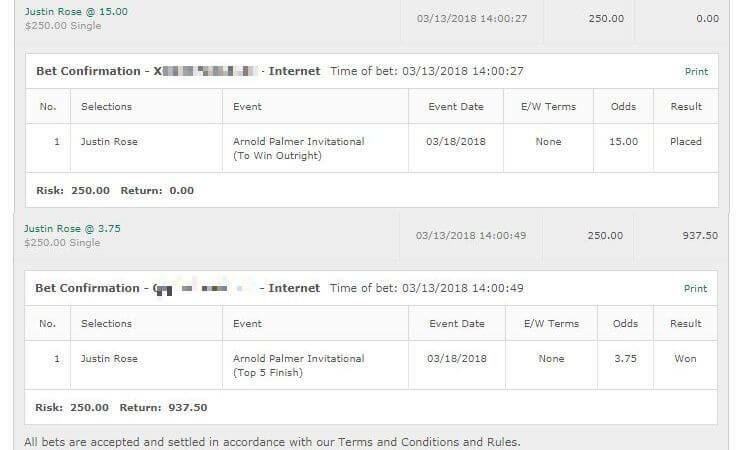 When it comes to course history there was a big redesign so we only really want to look at the last two tournaments for that, as well as of course current form. Rory McIlroy and Jordan Spieth are both playing in this. That’s always good as it usually makes the odds a bit more juicy for everyone else. We’re going to take Bubba Watson for a Top 5 Finish at 3.25 odds. Is Bubba Watson on form? Just ask everyone who played against him a couple of weeks ago at the Northern Trust Open which he won with a -15. At this tournament he has had a 3rd place and 2nd place in the last two years since all the changes, so we know his form is solid. However this is a tight tight tournament where a lot of people can perform extremely well so that makes us a bit wary of picking him as a winner. We’re comfortable with the 3.25 odds on a Top 5 here as we think it’s going to be tight. 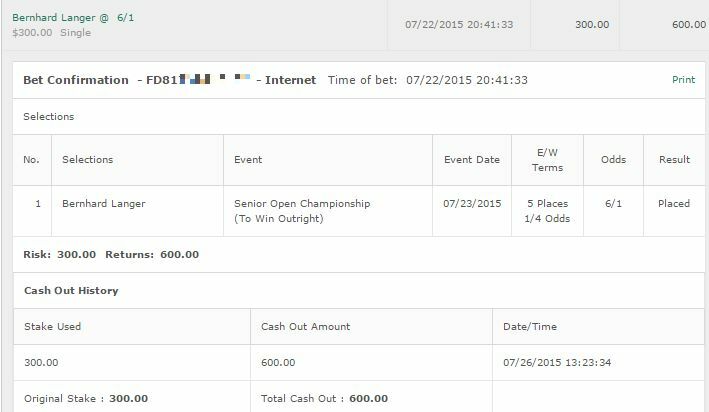 We’ll also place the same bet on Dustin Johnson who is 3.25 odds. Johnson had a 4th place at the Northern Trust Open and is coming into this on form. Johnson also has excellent course history and we think he can battle well here. And unfortuantely that’s all we’ve got this one. This is a very tricky tournament with so many potential winners and players. It’s going to be an absolute blast to watch though and we can’t wait. 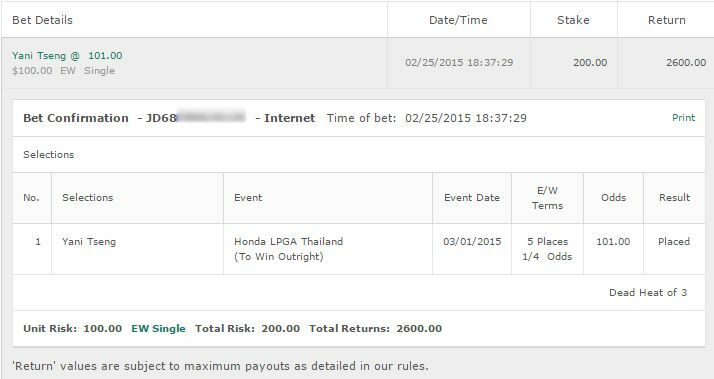 We’ve had very few LPGA Betting Tips this year as opposed to last year. The reason for that is it’s actually been a lot trickier to find value. I mean last year we had 80/1 winners etc but this year looking over everything we haven’t felt confident with a lot of them for whatever reason. This week is the HSBC Womens Champions event. Lydia Ko is is the big favourite to pick up her first win of the season. She’s had a 2nd place and a 3rd place so far. We’re going to take Lydia Ko to win this event. The odds aren’t great but looking at the competition we just don’t think anyone can beat her. Inbee Park isn’t playing the golf she should be – hell no-one is consistent at the top at the moment except for Ko. We’d also recommend a small bet on Stacy Lewis to win and E/W. Lewis most likely won’t win and she’s had some poor form at the last couple of tournaments but she’s played extremely well here before and if she can shake off her rather poor form she’ll be a contender and should get a Top 5 finish.